With a deep sense of sorrow, our family announces the passing of our mother and grandmother, Mitsuyo Yasui (Abe), on April 8, 2019 at the age of 97 years. Mitsuyo was born in Vancouver on May 8, 1921. 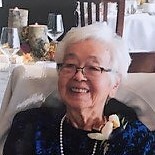 She raised her family in Coquitlam and later Edmonton, where she lived until moving to Calgary in 2014 after her husband, and our father and grandfather Shozo Yasui passed away. Mitsuyo is survived by her sons, Dennis (Benita), and Neil; her daughter, Diane; and her grandchildren, Stephen, Matthew, Alyssa, Krystal and Jennifer. She is also survived by her sister, Kimiko Hamaura, and numerous nieces and nephews. In addition to her husband Shozo, Mitsuyo was predeceased by her mother, Katsuyo; her father, Suekichi; her brother, Noboru; and her sister, Shizue Hatanaka.